Terry is downstairs grooming the dog. I have to stay upstairs when she does that because it bothers my allergies. Shane had pancakes this morning! Tonight Terry may take Shane and some friends to the boardwalk while my friend John and I go to a show in Philadelphia. I need more Acai berry juice; we're almost out. A short slapstick comedy routine from the virtually forgotten vaudeville team of Smith, Rogers & Eddie in the 1935 musical comedy short "Dublin in Brass". This team had an unusual gimmick of a n atrractive female "straight man" who also took part in the physical humor. This clip might possibly be the team's only existing appearance on film. We saw Kelly-Miller last night in Pemberton, NJ. Ryan and Steve do an amazing job, it was great to see them in action. 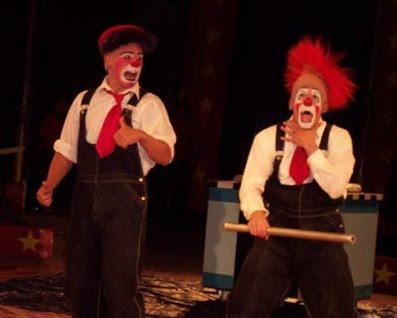 They are working hard, getting real laughs and connecting with the audience; classic circus clowning the way it should be done and rarely, if ever, is anymore. Casey's cat act has become something that is incredible and virtually unknown anywhere in the American mudshow circus: an act that is truly worth seeing. Nat and her dogs bring a much needed charm, showmanship and charisma to a show that is sorely lacking this season in all three. Because things are pretty pedestrian on "America's One Ring Wonder" this season. The show lacks any of the zip and pizazz it had last season with some of the most inexcusably poor pacing on any circus that I've witnessed in a very, very long while. After Ryan & Steve do a quick come-in and get the crowd going, Casey's cat act starts the show off right only to be followed by an insanely long peanut pitch while the cage is dismantled. I understand the economics of tent show performing as well as anyone but the time has come to retire the time honored burlesque show-era script of the Peterson Peanut Pitch in favor of something which accomplishes the same task with a greater emphasis on engaging and entertaining the audience throughout. After the peanut pitch the show moves forward only in fits and starts, trudging forward with the gait of a retarded, arthritic spider monkey with a gunshot wound to the temple. The whole first half could stand to be tightened up considerably and ends with an aerial web display to the tune of "Lovely Luawana Lady" that would most politely be described as seriously egregious in both concept and execution and as good an argument as I've ever heard to support Hawaiian succession. The second half starts off on the wrong foot with a very affordable flying act and rarely recovers it's footing, suffering from overlong stretches of thoroughly unnecessary "Kuliki Taka" on our way to an utterly underwhelming motorcycle on a wire and a completely WTF-and-out-of-left-field "Salute to Cowboys" finale. Things weren't perfect last season but they were considerably better than this. Last season Kelly-Miller gave the impression of a small show that was on the road to becoming something more. This season, uh... not so much. The problems aren't insurmountable and could be solved relatively quickly and easily but, this far into the season, any changes seem unlikely. Afterwards Terry, Shane and I enjoyed the hospitality at America's Own, which we shared with Ryan, Steve, Dan Berkley, Lisa Soverino and Cricket and Casey's new groom, Radar, which unfortunately possessed a far greater entertainment value for all concerned than great stretches of the preceding 90 minutes. Shane had a great time playing with Georgia and told us in the car that Genevieve, who we didn't get to meet, was beautiful. At about 3:10, after the South African tribal song by Miriam Makeba, the you'll see Don Saunders on Hollywood Palace hosted by Groucho Marx. The Nitwits (later known as Nuts & Bolts) on Hollywood Palace and introduced by Jack Benny. HARWICH, MASSACHUSETTS--- Once in a while a show comes along that is so unique, so inspired, and promises so much fun that it is an absolute must-see. “Elvis… The King And Me” is just such a show, and performer Jay Stewart is not to be missed in this one-man semi-autobiographical evening of live music and comedy featuring over 20 of The King’s hit tunes and ballads. Stewart, a brilliant physical comedian, along with a three-piece live band led by musical director Bob Wilder, lets the music take the lead in this story of the dizzying heights and bottomless heartbreaks of first love at age 13. Anyone who has survived adolescence can relate, and anyone who cranked up the tunes and sang into a hairbrush in front of the mirror to take the edge off teenaged loneliness and heartache will laugh along with Stewart. The show is a departure for Stewart, whose career spans 20 years of clowning. After earning a degree in theater at Wake Forest University, Jay entered circus life as a member of Clown Alley of The Greatest Show on Earth. He has traveled around the world, clowning in Tokyo and Osaka, Japan with the Kinoshita Circus, and in Liuzhou, China as a member of the first-ever Clowning Festival there. He enjoyed a four-year run as the Boss Clown of Clown Alley in the Ringling Bros. Circus, and later founded The Seaside Clowns, a troupe of veteran circus clowns. Jay currently performs with his talented wife Kristin and children Karen and Nick at Harwich Junior Theatre and at festivals and events Cape-wide. During the week he makes rounds as part of the Big Apple Circus Clown Care Unit at Children’s Hospital in Boston, bringing hilarity to the bedsides of hospitalized children. The idea for the show was born last fall, when Stewart performed an Elvis song during karaoke at a birthday party. The guests included HJT artistic director Nina Schuessler. Stewart knew that he didn’t want to dress up in a jumpsuit and become another Elvis impersonator. Instead, he was inspired by his own experiences growing up in the South with Elvis Presley’s music and the way it seemed to act as a soundtrack for his memories. Stewart praises the expertise of Schuessler, Wilder and the rest of the HJT staff and crew who helped him make the leap into unknown territory. The band features Wilder, described by Stewart as a magician, on keyboard and two extremely talented young men, Alex Harper on guitar and Phil White on drums. 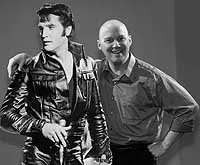 “Elvis… The King and Me” written by and starring Jay Stewart, with musical direction by Bob Wilder, opens June 12 and runs Friday and Saturday evenings through September. With sound design by J. Hagenbuckle, set design by Richard Archer, lighting design by B.J. Powell, costumes by Robin McLaughlin, and props by Mary Beth Travis. For information on matinees and additional show times or to purchase tickets, visit www.hjtcapecod.org or call the box office at 508-432-2002. Tickets are also available through Theatremania at 866-811-4111. Pete Geist appearing at this year's Lancaster Sertoma Club's annual fundraiser. Embedding disabled, please click the title of this post. Does anyone have any photos of the act?